The head of the Orthodox Christian Church in Greece, Archbishop Christodoulos, has provoked a diplomatic storm with neighbouring Turkey by describing Turks as barbarians who should not be allowed to join the EU. The Greek Government has distanced itself from the remarks, saying it wanted the European Union to be extended to include Turkey. Archbishop Christodoulos made the remarks during a sermon delivered in a packed church in the capital, which was filled by local television stations. Referring to the Turks, he said barbarians could not come into what he called the family of Christians. "We cannot live together," he said. The archbishop is no stranger to controversy and is well-known for his conservative views. But this latest outburst has clearly angered the Greek Government, drawing an immediate response from the foreign minister, who has been working hard to improve relations with Turkey. He said the vast majority of the Greek population supported a vision of peace and stability across the region - a vision which he said was becoming reality with the completion of the European Union. The Greek Government is a strong supporter of Turkey's bid for EU membership. Athens believes it is in its own national interest after the long years of Turkish occupation during the Ottoman Empire and the continuing hostility, which has almost led to war on several occasions. But the archbishop's comments may not have been motivated purely by his objection to Turkey joining the European Union. It may also stem from his power struggle with the overall head of the Orthodox Church, who is based in Istanbul. 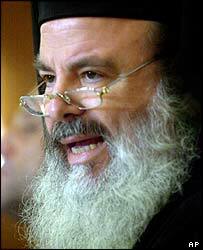 They are currently at loggerheads over who has the final say in the appointment of bishops in northern Greece.